Who are the Volunteer Auxiliary Police? Auxiliary police members are civic-minded men and women who volunteer to assist their local Police Precincts, Housing Police Service Areas, and Transit Districts, by performing uniformed patrol in their communities. They are recruited, trained and equipped by the Police Department. They come from many diverse backgrounds and many different occupations throughout the City, such as doctors, lawyers, librarians, computer technicians, security personnel, professors, college students, etc. Auxiliary Police recruits must pass a 18-week, 54 hour "Auxiliary Police Basic Training Course" which is classified as "Peace Officer Training". Auxiliary recruits are required by the New York State Municipal Police Training Council to undergo and pass this training course before they become Auxiliary Police officers. The training given in this course includes training in penal law, police science, powers of a peace officer, radio use, unarmed self defense, self defense with a straight wood baton, first aid, handcuffing techniques, and arrest procedures. In 2008, the NYPD revised the training course to include training in location and use of pressure points, dealing with domestic violence situations, firearm safety, and terrorism awareness. A written and physical exam is given at the end of training. Upon the completion of the Basic Training Course, the physical exam, and the written exam, probationary Auxiliary Police officers are issued their shield and police identification card along with their baton and initial uniform allowance voucher. All Auxiliary Police officers are required by New York State to pass an annual refresher course in the use of force with the straight baton, arrest procedures, and Equal Employment Opportunity (EEO) in order to maintain their peace officer status. Auxiliary Police officers are certified as "Peace Officers without Firearms Training" by the New York State Division of Criminal Justice Services-Municipal Police Training Council and are registered as peace officers in the NYS DCJS registry of peace officers. Although volunteers, Auxiliary Police officers are city employees while on duty and may be eligible for Workers' Compensation in the event of injury while on duty. Auxiliary Police officers who work the minimum required hours per fiscal year receive an annual uniform allowance check to help pay for new and replacement equipment and uniforms. Auxiliary Police officers may carry and use straight wood batons under the authority of NYS Penal Law 265.20 b.
Auxiliary Police officers can use physical and deadly force to make an arrest, or when a person uses physical or deadly force against an officer or a third person in accordance with the NYPD Auxiliary training manual. Daily patrol of assigned sectors within their respective precinct, transit district, housing area or specialized unit coverage area. Provide additional uniform police presence at parks, playgrounds, pools, street fairs, flea markets, block parties, shopping areas, subway entrances and exits, and school/church crossings. Assist with vehicular and pedestrian traffic at parades, marathons, concerts, intersections with broken traffic lights, accident scenes, and fire scenes. Assist in Precinct Identification Programs, Combat Auto Theft Program, Bicycle ID Program, Operation ID Program, Kid Care Program, and VIN Etching Program. A pair of Auxiliary Police Officers in the Highway Patrol unit. Auxiliary Police officers increase the public's perception of police "omnipresence" by patrolling in police cars, on foot and on bicycle. The police cars, known as RMPs or Radio Motor Patrols, are dark blue or black with white decals or white with light blue decals. Auxiliary Police officers wear virtually the same uniform as regular officers, and are equipped with straight wood batons, bullet resistant vests, police radios directly linked to the Central Dispatcher, other Auxiliary officers, and regular officers, flashlights, whistles, handcuffs, memo books, and reflective traffic vests. Their badge is a seven point star, in contrast to the shield worn by regular officers. Auxiliary Police officers in New York City are NOT permitted to carry a side arm at any time on duty, even if independently licensed to carry a firearm. In other jurisdictions within New York State, some police departments do allow their Auxiliary Police officers to carry a firearm. Auxiliary Police officers patrol presence, observations and reporting of incidents requiring regular police response, as well as interacting with the public, are meant to aid in crime reduction and enhance relations between the community and the police. Block off traffic at parades, accidents, fires, etc. Perform traffic control at broken traffic lights, accidents, etc. Respond to low priority 911 calls but not allowed to transmit finalization summary codes to the dispatcher. Make arrests for crimes not committed in their presence even if directed to do so by a regular police officer or a police dispatcher. 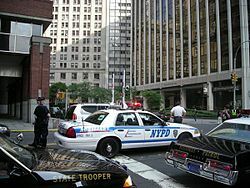 In 1991, the New York State Court of Appeals determined that Auxiliary Police officers are only partially covered under the "fellow officer rule", and therefore may not detain or arrest a person based on information from a dispatcher or police officer heard over a police radio or from a police officer in person, but are considered as a law enforcement officer with reliable information when making a report themselves to other law officers. Respond to any 911 calls involving any type of weapons or other life endangering conditions. Precinct Patrol: Officers patrol their respective precinct. When performing foot patrol, the area of the precinct that the officer patrols is called a Patrol Area, which are divided into "Foot Posts". RMP and Bike Patrol are also performed. Housing Bureau: Officers patrol their respective Housing (Police Service Area) precinct, mainly being a uniformed presence within the NYC housing projects. When performing foot patrol, the area of the precinct that the officer patrols is called Patrol Areas, which are divided into "Foot Posts". RMP and Bike Patrol are also performed. Transit Bureau: Officers patrol their respective Transit District precinct. When performing foot patrol, the area of the precinct that the officer patrols is called a Patrol Area, which are divided into "Foot Posts". RMP Patrol is also performed. CITYWIDE TRAFFIC TASK FORCE (CTTF): Officers patrol citywide to high crime areas all over the city that need special attention and extra patrol. However, more typical of this unit is traveling to precincts in Manhattan during special events such as concerts, marathons, parades, etc. to increase the police presence. They are involved in both vehicle and traffic control. They do not confine themselves to one location or precinct. Harbor Unit: Officers patrol New York City's waterways. A marine background such as one obtained through the coast guard, military, or other marine background is required. Undercover Vice Ops: Officers that have not reached the age of 20 years and 6 months old can be utilized to assist the NYPD Vice Unit Narcotics Division for "Quality of Life enforcement" stings which address illegal alcohol, knife, and spray paint sales. Other than this exception, NYPD Auxiliary Police officers are never undercover (*unless authorized by the Police Commissioner or Commanding Officer of the Auxiliary Police) and always patrol in uniform. Officers who have received the necessary "Vice Training" may be used by their Command in non-hazardous surveillance with the supervision of regular police officers. The Auxiliary Police also has a Ceremonial Unit made up of a small group of Auxiliary officers. An New York City Police Department Highway Patrol Auxiliary RMP. RMP (Auxiliary Police Car) - cars are painted white with light blue decals. Van (15 passenger; Used for routine patrol and officer transport) - vans are painted white with light blue decals. In most cases, Auxiliary Police vehicles are retired vehicles that were once used by regular officers. Once the vehicle attains a certain amount of mileage, it is taken out of service and is either redecaled and given to a command for the Auxiliary Police, or is sold. Auxiliary Highway Patrol RMPs are retired RMPs previously used by regular Highway Patrol officers. Most commands only have 1 Auxiliary vehicle, but some have 2 or more. The amount of Auxiliary vehicles per command is based on how many Auxiliary officers are working there and how many extra vehicles the NYPD has available. It should also be noted that older Auxiliary vehicles are painted either dark blue or black with white decals in contrast to the vehicles used by regular officers, which are white with light blue decals. In 2008, the NYPD changed the paint and decal color of Auxiliary vehicles to white with light blue decals in order to look like vehicles used by regular officers and as an economy measure to save money by not having to repaint the vehicles. Officers wishing to operate a bicycle, RMP, or van need special training before they are allowed to operate them. Training is done by the Police Academy Driver Training Unit (PADT) which is located at Floyd Bennett Field in Brooklyn. The golf cart, which is special to the Central Park Precinct, also requires special training to operate. The NYPD promotes the safety of its Auxiliary Police officers by requiring that they not pursue dangerous situations, but rather to remove themselves from such danger immediately. During training, recruits are repeatedly told that their purpose is to be the "eyes and ears" of the Police Department, and they are not required to enforce the law unless absolutely necessary. Although they are equipped with wood batons and (optional) handcuffs, they are told that their most powerful weapon is the police radio, which allows them to call for back-up officers to the scene. Auxiliary Police officers are not issued, there are not permitted to carry firearms while on duty, even if they are police officers/peace officers or licensed gun owners. There is still risk involved in being an Auxiliary officer. On March 14, 2007, two Auxiliary Police officers—Eugene Marshalik and Nicholas Pekearo—were killed in a shootout in Greenwich Village. This was the first time NYPD Auxiliary Police officers were killed in the line of duty since 1993. Up until March 26, 2007, the NYPD did not issue or subsidize ballistic vests to Auxiliary officers. But after the shootings of Pekearo and Marshalik, Mayor Michael R. Bloomberg and Commissioner Raymond W. Kelly asked the New York City Council to earmark more than 3.3 million dollars to provide all Auxiliary Police officers with Level IIIA Vests, the same used by full-time officers. On March 27, 2007, the City Council approved this bill, which had all Auxiliary officers equipped with vests. Since then, in 2010, funding for vest for Auxiliary Police Officers has ran out of the NYPD City Budget. Every Police Precinct, Housing Police Service Area and Transit District has a pool of "loaner" vest for new Auxiliary Police Officers to use while on patrol, afterwards, they are returned and secured by the Auxiliary Coordinator.